"Meenakshi's open-hearted chanting soothes the heart and frees the spirit." "SWAHA's Salutations is soft and sweet and full of heart." "Swaha has a sweet Deva-Premal-like quality, which reflects the purity of Meenakshi's voice and Ron Reid's production and keyboard work." Ron Reid and Marla Meenakshi Joy have been teaching a variety of inspired yoga classes and workshops which are Ashtanga and Vinyasa based fort he past 30 years. Their reach has been global for the past 20 years. With their band SWAHA they have been leading kirtan (call-and-response chanting) and teach yoga and music in a unique combination. Inspired by Ashtanga Vinyasa Yoga, (and the vinyasa practice as a whole) they inform it with intelligent natural body alignment principles, SWAHA YOGA is designed ultimately to tap the creative spark within, and approach the Yoga practice as a Whole (8-limbed path). Their home studio DOWNWARD DOG is based in Toronto and has been a destination for yoga since 1997 and belongs to the TOP 10 yoga studios in Canada. They are Master teachers, and their Teacher Training program is top notch and well known around the world. 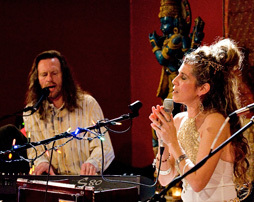 Ron Reid and Marla Meenakshi Joy perform and compose music that is both inspiring and uplifting. 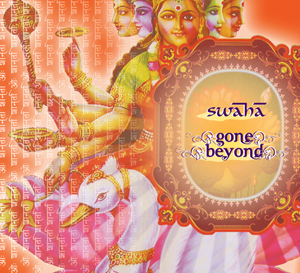 SWAHA invites the soul to sing, it is an enticing blend of ethereal Sanskrit vocals soaring over rich earthy rhythms. Swabhava is the Sanskrit word for „one’s innate disposition or nature which is inherent in all Beings. SWAHA YOGA embodies the qualities of “Exploration“, “Playfullness“ and “Self-connection and expression“. Ron Reid and Marla Meenakshi Joy encourages each individual to explore their full potential in themselves, on all levels. SWAHA music is inspiring and uplifting…. SWAHA’s soulfulness and grooves invites the soul to sing! Swaha's newly released digital album "Gone Beyond"
2012 Holiday Celebration at Downward Dog: Swaha plus special guests perform Mangala Mantra to close out an evening of celebration.